Bioware announced on their forums that the star-crosseed DLC for Dragon Age, Return to Ostagar, will roll out on Xbox Live today. Despite word from Bioware founder Ray Muzyka that RTO was coming next week, the company announced on their forums that the Xbox 360 version of the DLC will be available at some point today, depending on where you live. Also, the announcement comes with an update to the game which fixed quite a few bugs that users reported with Achievements. One gameplay change is that once you reach level 14, all specializations which were obtainable by purchasing a book from a merchant will automatically be available to your party. The PC and PS3 versions of the update are still in testing with the PC update available "early next week," according to the announcement. There is no word on a timeframe for the PS3. 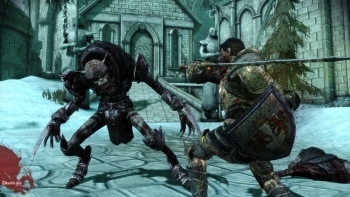 Some players were unable to unlock the four achievements from Warden's Keep and the Stone Prisoner during the first four days of launch. These achievements will unlock properly once you sign in to your Xbox Live and EA accounts. The previous Xbox 360 update update introduced an issue that relocked class specializations. This title update will resolve that issue. After loading a previously saved game, specializations that have been unlocked through gameplay will be available again. All book-based specializations will now automatically unlock once the Warden reaches level 14. Books will still be available from vendors so you can unlock these specializations before level 14. The Hopeless Romantic, Perfectionist and Recruiter achievements were not unlocking for some players. This issue has been resolved. To update and unlock these achievements automatically, load a saved game where the Warden has completed the requirements for these achievements. The Recruiter achievement will still require a recruitment to occur after the save is loaded. If you have completed all the requirements for Recruiter, and the achievement is still locked, load an earlier saved game where you are still able to recruit any party member. Once you have recruited a party member, the achievement should unlock. This should work even if your current saved game still has unrecruited characters, but you have recruited all of them in previous play.